Q1. What entity requests access to a resource? Answer: B. A subject is the active entity that requests access to a resource. Q2. In which phase of the access control does a user need to prove his or her identity? Answer: B. Authentication is the process of proving one’s identity. Answer: A and C. Password and PIN code are examples of authentication by knowledge. Q4. When a biometric authentication system rejects a valid user, which type of error is generated? Answer: C. False rejection rate (FRR) refers to when the system rejects a valid user that should have been authenticated. Q5. In military and governmental organizations, what is the classification for an asset that, if compromised, would cause severe damage to the organization? Answer: B. In military classification, the Secret label is usually associated with severe damage to the organization. Q6. What is a common way to protect “data at rest”? Answer: A. Encryption and storage media access controls are commonly used to protect data at rest. Q7. Who is ultimately responsible for security control of an asset? Answer: A. The asset owner and senior management are ultimately responsible for the security of the assets. Answer: A and B. Preventive and Deterrent access controls are controls used to prevent a breach. Q9. Which access control model uses environmental information to make an access decision? Answer: B. Attribute-based access control (ABAC) uses subject, object, and environmental attributes to make an access decision. Q10. What is the main advantage of using a mandatory access control (MAC) model instead of a discretionary access control (DAC) model? A. MAC is more secure because the operating system ensures security policy compliance. B. MAC is more secure because the data owner can decide which user can get access, thus providing more granular access. c. MAC is more secure because permissions are assigned based on roles. D. MAC is better because it is easier to implement. Answer: A. MAC offers better security compared to DAC because the operating system ensures compliance with the organization’s security policy. Answer: A and B. Classification and category are typically found in a security label. Q12. Which access control model uses the function of a subject in an organization? Answer: C. Role-based access control (RBAC) uses the role or function of a subject to make access decisions. Q13. 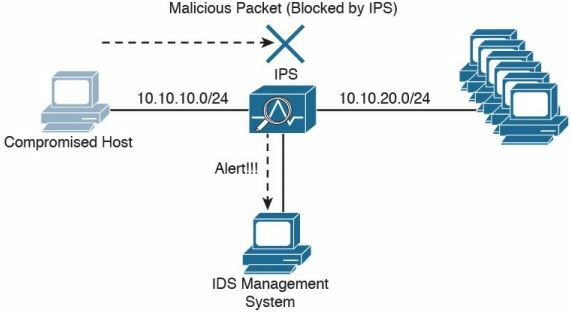 Which IDS system can detect attacks using encryption? Answer: C. Host-based IDS can detect attacks using encryption, because it can see the decrypted payload on the host. Q14. Which of the following is not a disadvantage of host-based antimal ware? A. It requires updating multiple endpoints. B. It does not have visibility into encrypted traffic. C. It does not have visibility of all events happening in the network. D. It may require working with different operating systems. Answer: B. Host-based antimalware can detect attacks using encryption, because it can see the decrypted payload on the host. Q15. Which type of access list works better when implementing RBAC? Answer: D. A security group access list (SGACL) implements access control based on a security group tag (SGT) assigned to a packet. The SGT could be assigned, for example, based on the role of the user. Q16. Which of the following is not a true statement about TACACS+? A. It offers command-level authorization. B. It is proprietary to Cisco. C. It encrypts the TACACS+ header. D. It works over TCP. Answer: C. TACACS+ encrypts the TACACS+ message payload. Q17. What is used in the Cisco TrustSec architecture to provide link-level encryption? Answer: A. Cisco TrustSec uses MACSec to provide link-level encryption. Q18. In which phase of access control is access granted to a resource with specific privileges? Answer: C. In the authorization phase, access is granted to a resource. Answer: A, B, C. Uniqueness, nondescriptiveness, and secured issuance are characteristics of a secure identity. Q20. Which of the following authentication methods is considered strong? Answer: D. Strong authentication is obtained by the combination of at least two methods. Q21. Who assigns a security classification to an asset? Answer: A. The asset owner assigns the classification. Q22. Which type of control includes security training? Answer: A. Security training is a type of administrative control. Q23. Which technique ensures protection against simple and noninvasive data-recovery techniques? Answer: A. Clearing ensures protection against simple and noninvasive data-recovery techniques. Q24. Which type of control best describes an IPS dropping a malicious packet? Answer: A. Dropping a packet prevents a security incident from occurring. Q25. Which type of controls best describe a fence? Answer: C. A fence is an example of physical deterrent control. Q26. What is included in a capability table? Answer: A. A capability table is user centric and includes several objects with user access rights. Q27. Where does the RADIUS exchange happen? Answer: B. The RADIUS exchange happens between the NAS and the authentication server. Q28. Which AAA protocol allows for capabilities exchange? Answer: C. Diameter allows for the exchange of nodes’ capabilities. Q29. Which port access control technology allows dynamic authorization policy to be downloaded from the authentication server? Answer: C. 802.1x allows authorization policy to be downloaded and enforced at the access device. Q30. Where is EAPoL traffic seen? Answer: B. EAPoL messages are transmitted between the supplicant and the authenticator. Q31. What is the Security Group Tag Exchange (SXP) protocol used for? Answer: B. SXP can be used to exchange SGT between an access device with only Cisco TrustSec capability on software and a device with Cisco TrustSec hardware support. Q32. A host on an isolated port can communicate with which of the following? Answer: D. An isolated port can only communicate with the promiscuous port. Q33. What is a disadvantage of using an IPS compared to an IDS? A. It may add latency due to packet processing. B. It is not able to drop a packet. C. To stop an attack, it relies on external devices such as a firewall. D. It is more difficult to maintain. Answer: A. An IPS may add latency due to its packet-processing engine. Q34. What is an advantage of network-based antimalware compared to a host-based solution? A. It can block malware at the entry point. B. It can check the integrity of a file on the host. C. It can receive a signature and reputation from the cloud. Answer: A. Network-based antimalware can block malware before it enters the network. Answers C and D are true for host-based antimalware as well. Answer B applies only to host-based antimalware. Q35. According to the attribute-based access control (ABAC) model, what is the subject location considered? Answer: A. Location is part of the environmental attributes. Q36. Which of the following access control models use security labels to make access decisions? Answer: B. MAC uses security labels for access decisions. Q37. What is one of the advantages of the mandatory access control (MAC) model? B. Stricter control over the information access. D. The owner can decide whom to grant access to. Answer: B. Strict control over the access to resources is one of the main advantages of MAC. Q38. In a discretionary access control (DAC) model, who can authorize access to an object? Answer: A. In a DAC model, the object owner grants authorization permission over the objects he owns.